Late on a Monday afternoon, Frederick Janka sits in the minimalist Carolyn Glasoe Bailey Foundation space in Ojai, Calif. Janka is nestled amongst stacks of art books sipping espresso when I come by. We catch up for the first time since he left his position at the Museum of Contemporary Art Santa Barbara to take a look at Ry Rocklen’s new exhibition-in-flux “Pixievision,” which Janka developed as the Foundation’s new Executive Director. Sister of the Foundation’s namesake and President, Lila Glasoe Francese, stops by to shoot off some quick emails before jetting off to cocktail hour in Downtown Ojai with Heather Stobo of The Porch Gallery. We sit facing one another in white leather scoop-chairs momentarily before I climb to a more comfortable position on the floor sipping Perrier. Statured yet soft-spoken Janka slings his arm on the back of the lounge chair, and we squeeze fresh juice from the California Coast art scene. Hannah De La Viña: So. How do you interpret the mission of the Foundation? Frederick Janka: The mission of The Carolyn Glasoe Bailey Foundation since it was founded is to support the Arts & Sciences. My vision is to keep artists at the center, and regard them as the catalysts. I like to let the artists take the reign and explore the science of looking — as an art. HDLV: The science of looking, I completely connect with that. Artists see the world in such an interesting way. Creating space to do that is really a gift. FJ: Exactly. Artists have a unique way of reflecting back to society. My goal is to give them the perspective to do that. That is how we are fulfilling our mission. HDLV: And you’re doing an excellent job, Freddie. I love it! HDLV: What would you say is the greatest accomplishment of Glasoe Bailey herself? FJ: The ethos we keep at the foundation is keeping the artist at the center. Carolyn was very artist-centric. She was incredible: she started her first gallery at 19 in Minneapolis and championed artists all over. Her career as a curator and dealer just blossomed from there. She was very good about supporting artists’ everyday needs — she was happy to step in to help pay a bill, fly an artist home for the holidays or source clients to purchase works. FJ: Yes. She really cared about artists; we really care about artists. HDLV: So I know that she was also with the Museum of Contemporary Art Santa Barbara (MCASB); which is also how we know each other. Did you two work together personally? FJ: We were friends for, I can’t count the years. Back before I came to Santa Barbara. HDLV: Wait, so from New York? That’s how you know each other? FJ: Yes. We spent a lot of time together in New York but we actually met originally during the art fairs in Miami. At the time I was working for NADA (New Art Dealers Alliance) doing the membership and programs during the art fairs in Miami. FJ: I remember hosting some dinners she was at back then. She was a friend for many years. She and her husband actually hosted my wedding at her house in Ojai about 6 years ago. That is how the two of us originally connected. So she really paved the way for you. FJ: She did. However, we didn’t really get to do much together after I got here. About a week after I got here she was diagnosed with stage four brain cancer. Basically I started at Museum in 2014, and just after we caught up in September about a week later she was diagnosed. It was really special to get to spend that last year of her life with her, here in Ojai. HDLV: Oh my gosh. Devastating. Yes, actually my mother passed away last year from brain cancer as well, so it’s definitely something that I can relate to. Ojai is so healing for that kind of experience. The creative community is so supportive and I think that really draws people in. And makes us stay. FJ: Yes, that community is actually what drew her here initially. It was after she and her husband first got married. They travelled throughout California and found Ojai was this really special refuge. HDLV: I love that. Yes, it has definitely been a place of “refuge” for me as well. FJ: Exactly. She had clients all over the world, but would always come back to Ojai to get away. HDLV: What role do you see the Foundation playing in the Ojai arts community now? FJ: Our intention is to be a platform for Contemporary Art and culture. To be a leader and a gateway to a broader audience. I also see the space as being a gathering place for artists. Almost like a clubhouse. HDLV: Like a cafe, or a salon. HDLV: You nailed it. I can sit here on the floor having coffee and I’m so comfortable so…la de la, chit-chat. So you’re definitely doing a good job with that! FJ: Exactly, we want to enhance conversation in the community. HDLV: Having such an extensive network in the Art World yourself, do you push yourself to bring Ojai artists to the international community? FJ: Well with some incredible artists we work with—Ruth Pastine, for example, who is based in Ojai, what we are doing is bringing attention to Ojai. We are a conduit: we take people in and we push people out. My personal network is definitely intrigued by what is happening here. We do have a large reach in that sense. Our podcasts on iTunes are one way of getting our story out. HDLV: So, say you got a huge grant for the Foundation. What would be your fantasy project? FJ: Absolutely, a large grant would allow us to create a permanent space. We are renting right now. Currently, we are set up as a 501(c)3, we are not a private foundation. Meaning, we rely on the generosity of the community. We worked with our incredible art lawyer Christine Steiner to form the foundation at record speed…We do serve an important role in the Ojai area and would love to continue to do so well into the future. HDLV: Carolyn Glasoe Bailey has such a sophisticated artistic legacy and the Foundation brings an international set of eyes to the community. I think it’s really important to keep it alive. FJ: Financial sustainability is the big goal for us. A permanent space would be the dream. HDLV: So let’s talk art. What’s on the horizon? FJ: So our current exhibition, Ry Rocklen’s “Pixievision” runs through September. The theme we have going for fall is sort of… how do I wordsmith this — learning the wrong way. FJ: Yes, so doing things backwards. Challenging the status quo, whether it be through process or experience. Experimenting and learning as part of a greater practice. Ceramic sculpture artist Kelly Akashi is leading a workshop in the fall. Yassi Mazandi, who is from Iran originally but works in Los Angeles, is going to be our November show. That’s her ceramic piece in the window, there. HDLV: Ah yes, it looks like it should be made out of metal but it’s made out of stone. Challenging notions there big time. FJ: Exactly. So she’s our big fall show. She will lead a ceramics workshop as well, and Yassi will host a podcast. HDLV: Love it. Ojai has such an incredibly rich ceramics community. FJ: Yes and a history with it as well. The legacy of Beatrice Wood… Really set the tone for ceramic arts in Ojai. HDLV: She was so inspiring. So tell me about the show with Ry? FJ: Ry Rocklen works in ceramic as well. 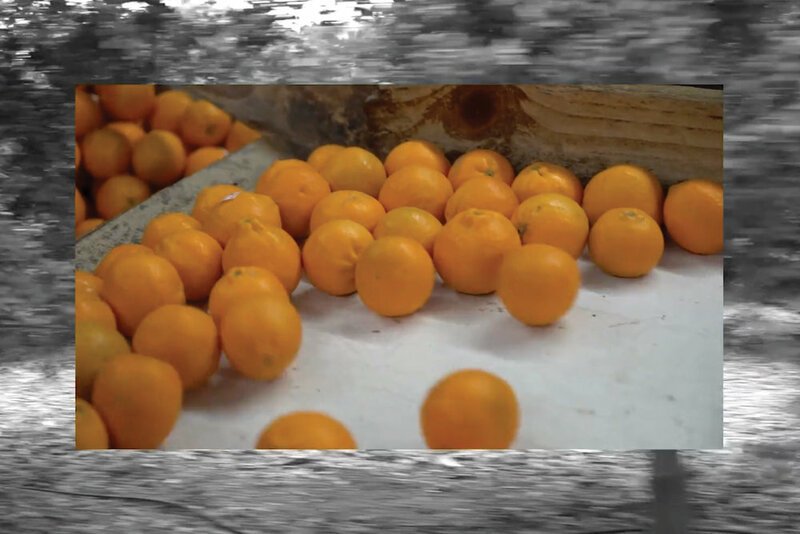 He created a whole series of pixies, which are the signature Ojai fruit, from oranges that he peeled himself. HDLV: They look like little starfish. FJ: Yes, or amoeba plastered to the walls. Then he filmed the whole process. Lila Glasoe Francese: Ry is a doll. Everyone loves him the second they meet him. He makes a great impression. LGF: He really helped us grow and the arts community helped in a big way... Anyway, nice to meet you, Hannah. I am off to meet Heather (Sobo) at The Ojai Vineyard (aka. The Foundation’s Satellite Office). HDLV: That's amazing. So nice to meet you Lila, ta-ta! So, Freddie. What do you feel is the highlight of "Pixievision"? FJ: The film is really the highlight until he finishes the sculpture for The Food Group. It allows the community to really see inside the process and see through an artists eyes. It’s incredibly creative storytelling but the post-production is really what lets the viewer in. We are encouraging Ry to submit into more film festivals and acting as a partner in that way. HDLV: And how did you two meet? FJ: Trophy Modern Furniture. This is like early 2015. He and his partner Carolyn Pennypacker Riggs, choreographer and performance artist, have a house in Joshua Tree called the “Trophy Modern House.” All the furniture is from the series. It’s livable art. So anyway, we did that project years ago. Ry is a great artist to work with. Very creative and flexible. There is humor in it. That is what makes it. People love these little pixie-peels, they have so much personality. HDLV: Humor is so important. FJ: Yes. So I am looking at my engagement with artists being dynamic, spanning from the inception to an open span of time. Repeat engagement — long term goals, realization of plans and allowing organic ideas to come to life. HDLV: That makes perfect sense. As we both know, artists don’t like rules and to put a static end to the process with the exhibition opening can be limiting. It seems like you are really keeping the mission in mind by keeping the artist at the heart this way. It’s a very unique way to run the Foundation. Ry’s “Pixievision” comes as something of a series as well. The Food Group continues with the Foundation. We brought him to Ojai to let him experience Pixie Season organically. HDLV: Love pixies. We all live a pixie lifestyle here. Pixie juice for breakfast, pixie body scrub…Yum. HDLV: Wow. Emily Thacher, that's like Ojai royalty, huh? So what's going on, what are you doing these days? HDLV: You know me, always pulled back and forth to New York. This last year since my mother passed has been all about family for me. I spend most of my time up at my ranch in Gaviota. FJ: I mean — New York will always be there. What’s Gaviota like? HDLV: It’s all about the trees. Here in Ojai we are all about the Pixies and in Gaviota it’s the Oaks. On my ranch in Gaviota I go on a walk everyday — it’s actually the original Highway 1 that I walk on — underneath the most beautiful cathedral of Oaks the whole way. It is my way of healing and getting through the passing of my mother. It’s nice to have roots. FJ: Yes we love Oak trees as well. The gifts of the Earth. HDLV: Very peaceful. Enough about me, tell me what has been your best moment since taking on the role with the Foundation? FJ: Definitely The Art Prize Gala Weekend. It was 5 events in 4 days. We did a friends & family welcome, a VIP dinner then Ry Rocklen and I co-organized an event at The Porch Gallery… A beautiful donor’s dinner at Rancho Matilija. Followed by a bus tour to the Farmer’s Market and a stop to meet with the Friend’s Ranch family, who pack and source the Ojai Valley's citrus. At the end of the tour, we took everybody to the Turtle Conservancy to say hello to our endangered turtle and tortoise friends. It was so enriching and positive for Ry and the community as a whole. The whole weekend was an incredible collective of artists, collectors, curators and gallerists. Really a great mix of people. HDLV: Good for you. Amazing way to continue the legacy of your dear friend, Carolyn Glasoe Bailey. HDLV: Thank you, Freddie. You are a delight! Ry Rocklen’s “Pixievision” runs through September 30th, 2018 at The Carolyn Glasoe Bailey Foundation [248 S Montgomery Street Ojai, CA 93023]. The show is an ongoing multimedia experience, and the artist is in the process of creating a significant sculptural piece to cement the piece’s role amongst his series, The Food Group. For inquiries, contact: friendsofcarolyn@carolynglasoebaileyfoundation.org.